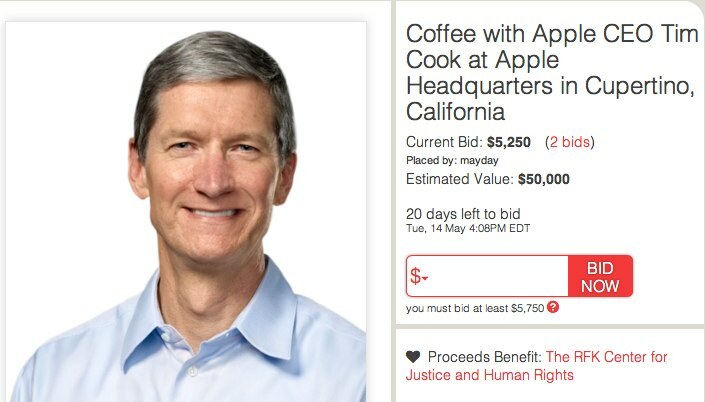 Charity auction site CharityBuzz is hosting a listing to have coffee with Apple CEO Tim Cook at Apple's Cupertino headquarters (via The Next Web). The proceeds from the auction will benefit the RFK Center for Justice & Human Rights, a fitting charity as Cook said at the D10 conference that Bobby Kennedy was one of his heroes. The high bid on the listing, which closes on May 14th, is currently at $5,250, with an estimated value of $50,000. Legendary investor Warren Buffett routinely auctions lunch with himself for charity. Last year's auction sold for nearly $3.5 million. The winner won lunch for eight with Buffett at Smith & Wollensky in New York. The auction covers two attendees for a 30-60 minute meeting at a mutually agreed upon date. Update: The RFK Center has issued a press release announcing the group of roughly 100 celebrity auctions, specifically drawing attention to the coffee meeting with Cook. In an unprecedented donation, Apple CEO Tim Cook is offering the opportunity for a winning bidder and guest to join him for coffee at the Apple Headquarters in Cupertino, CA. The experience, valued at $50,000, marks the first time one-on-one access to Cook has been offered on the auction block. This is for charity. The object is to get as much money as possible to donate to the charity. Has nothing to do with his ego. More to do with getting as much as you can for the charity. What an easy way to raise money for charity - someone with deep pockets who wouldn't otherwise get to hang with Tim gets to chill for a coffee and chat, and some charity makes bank. How can people find something wrong with this? Steve would never have allowed these charity activities. $833 per minute. Choose your words wisely. Awkward silence the rest of the meal. Let's all pitch in so we can send Arn to ask him about the Mac Pros! Bring your Nexus 4 with you! Is that cancer of laying on the floor?